I will make a present of a poppy which has turned red for you who need a break from the hectic routine for a while. Please brighten up your closest space with a small and quite flower in its bloom. We added the least design while keeping natural beauty of natural material itself the most. 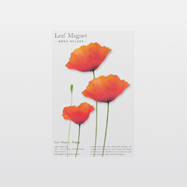 Realistically made poppy-shaped magnet can be used for various places like partition, white board, refrigerator and etc and you can create the feeling of poppy fluttering down with it as interior prop.